Now that we have our example application setup, we should devise a recovery plan. A recovery plan is a set of documented procedures to recover from potential failures or administration errors within your server setup. Creating a recovery plan will also help you identify the essential components and data of your application server setup. A very basic recovery plan for a server failure could consist of the list of steps that you took to perform your initial server deployment, with extra procedures for restoring application data from backups. A better recovery plan might, in addition to good documentation, leverage deployment scripts and configuration management tools, such as Ansible, Chef, or Puppet, to help automate and quicken the recovery process. In this part of the tutorial, we will demonstrate how to create a basic recovery plan for the example WordPress application that we set up. Your needs will probably differ, but this should help you get started with devising a recovery plan of your own. Our basic requirements are that we are able to recover from the loss of any server in the setup, and restore the application functionality and data (up to a reasonable point in time). To fulfill this goal, we will create an inventory of each server, determine which data needs to be backed up, and write a recovery plan based on our available assets. Of course, if any of these recovery plans are executed, the application should be tested to verify that it was restored properly. Let's get started with the database server. By looking at how we created the database server, we know that it can be recreated from scratch aside from the contents of the database itself (created in step 4). In our WordPress example, most of the application data (i.e. blog posts) is stored in the database. 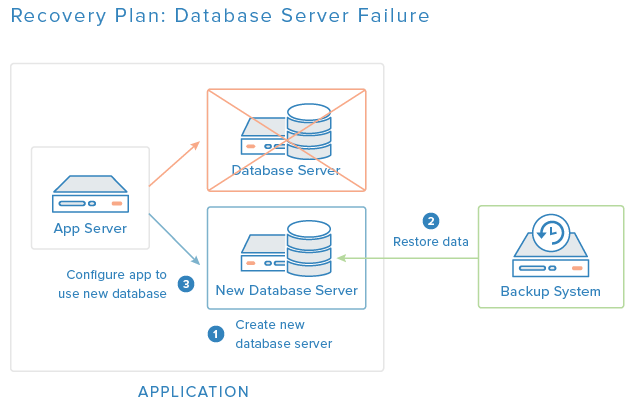 This means that we must maintain backups of the database if we want to be able to recover the database server. We will also back up the MySQL configuration file since it was modified slightly. Now that we have an outline of the database server recovery plan, we should work out the details of the recovery steps and ensure that we maintain the required backups. We will leave it as an exercise to the reader to detail the recovery steps, as they will differ depending on the actual setup. In the example case, we can use the application deployment tutorial as the documentation to base our recovery steps on. By looking at the set up steps, we know that our application server can be recreated from scratch aside from the application files. In our WordPress example, the application files include the WordPress configuration files (which includes the database connection information), installed WordPress plugins, and file uploads. This means that we must maintain backups of the application files if we want to be able to recover an application server. Because the application files are set up to be replicated across multiple application servers, we only need to restore the data from backups if all of the application servers fail or if the data is corrupted somehow. If at least one application server is running fine, with the correct application files, setting up file replication again will restore the proper files to the new application server. Now that we have an outline of the application server recovery plan, we should work out the details of the recovery steps and ensure that we maintain the required backups. We will leave it as an exercise to the reader to detail the recovery steps, as they will differ depending on the actual setup. In the example case, we can use the application deployment tutorial as the documentation to base our recovery steps on. By looking at this inventory, we know that our load balancer server can be recreated from scratch aside from the files related to the SSL certificate. This means that we must maintain backups of the SSL certificate files if we want to be able to recover the load balancer server. We will also include the HAProxy configuration file in our backups. Now that we have an outline of the load balancer server recovery plan, we should work out the details of the recovery steps and ensure that we maintain the required backups. We will leave it as an exercise to the reader to detail the recovery steps, as they will differ depending on the actual setup. In the example case, we can use the application deployment tutorial as the documentation to base our recovery steps on. If the recovery of one of the components requires you to reconfigure any other components, e.g. the database server IP address changes, make sure to include the appropriate steps in your recovery plans. You will also want to write up recovery plans for all of the other components that exist in your setup, such as your DNS, and for all the components that you will add in the future, such as your backups servers, monitoring, and logging. As your server setup evolves, you should iterate on your existing recovery plans. We also haven't covered how to create and restore backups yet, so we will have to fill those details in later. We will cover backups in the next part of this tutorial. After preparing the recovery plans for your various servers, you should keep this information somewhere that is accessible to whoever needs to be able to perform a recovery, completely separate from your server setup. Continue to the next tutorial to start setting up the backups that are required to support your new recovery plan: Building for Production: Web Applications — Backups. This 6-part tutorial will show you how to build out a multi-server production application setup from scratch. The final setup will be supported by backups, monitoring, and centralized logging systems, which will help you ensure that you will be able to detect problems and recover from them. The ultimate goal of this series is to build on standalone system administration concepts, and introduce you to some of the practical considerations of creating a production server setup. This tutorial will demonstrate how to plan and set up a sample production application from start to finish. Hopefully, this will help you plan and implement your own production server environment, even if you are running a different application on a completely different technology stack. Because this tutorial covers many different system administration topics, it will often defer the detailed explanation to external supporting articles that provide supplemental information. In this part of the "Building for Production: Web Applications" series (3 of 6), we will devise a recovery plan. A recovery plan is a set of documented procedures to recover from potential failures or administration errors within your server setup. Creating a recovery plan will also help you identify the essential components and data of your application server setup. In this part of the "Building for Production: Web Applications" series (4 of 6), we will set up the backup system that is required to support our recovery plan. This tutorial will focus on using Bacula as a backups solution. The benefits of using a full-fledged backup system, such as Bacula, is that it gives you full control over what you back up and restore at the individual file level, and you can schedule backups and restores according to what is best for you. In this part of the "Building for Production: Web Applications" series (5 of 6), we will add monitoring to improve our awareness of the state of our servers and services. Monitoring software, such as Nagios, Icinga, and Zabbix, enables you to create dashboards and alerts that will show you which components of your application setup need attention. The goal of this is to help you detect issues with your setup, and start fixing them, before your users encounter them. In this part of the "Building for Production: Web Applications" series (6 of 6), we will set up centralized logging for our production application setup. Centralized logging is a great way to gather and visualize the logs of your servers. Generally, setting up an elaborate logging system is not as important as having solid backups and monitoring set up, but it can be very useful when trying to identify trends or problems with your application.